A sobering study published this month in Space Weather warns why we need to get better prepared for disruptive space weather events – particularly coronal mass ejections. The current solar maximum – a period of high solar activity – is showing only a moderate amount of sunspot activity. However, recent space weather events, some of which have resulted in geomagnetic storms on Earth, have been far from insignificant. 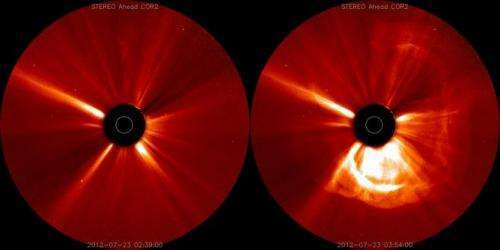 A solar eruption, called a coronal mass ejection, hit the STEREO-A spacecraft which was located ahead of Earth in its orbit around the sun. The speed and magnitude of this disturbance were extreme (to say the least). It travelled from the sun's surface out to the distance of Earth's orbit (1 AU; astronomical unit, the mean sun-Earth distance) in 19 hours. Typically, space scientists allow two to three days' travel time for coronal mass ejections. The 2012 event – one of the fastest ejections ever measured – was initially estimated to be travelling at 2,500 km/s, almost ten times greater than typical solar wind speeds! One of the ways space scientists rate the intensity of a particular geomagnetic disturbance on Earth is the Dst index. This measures the magnetospheric "ring current" that encircles the Earth. The more negative the Dst (expressed in nanotesla; nT), the more intense the storm. In 2003, the Halloween geomagnetic storms caused all sorts of problems across a wide range of technological applications; they were only half the Carrington event's intensity. Our ability to use the Carrington event as the "worst-case scenario" is greatly limited by us having very few data from this 19th century event, obviously due to the lack of technology at the time. But the authors of the Space Weather paper believe that the recent record-breaking July 2012 event, for which we have direct and reliable solar wind measurements, can now be used by these infrastructure operators in their "worst-case scenario" modelling, to see how their infrastructure would cope with such an event. There is much to be learnt from the July 2012 space weather event. It would be quite a failure for us not to seriously use the data from this "shot across the bow" to better protect ourselves in the future.